You just had your transmission rebuilt and it seems to be working fine but the shop wants you to bring it back for a 10-day recheck. Don’t worry, there’s no problem. The 10-day recheck is a valuable part of the rebuild procedure. It gives the technicians a chance to look for any minor issues that you wouldn’t notice under normal driving conditions. And, if they find something wrong, like a slight leak or a slipped adjustment they can take care of it now, while it’s still a minor situation. 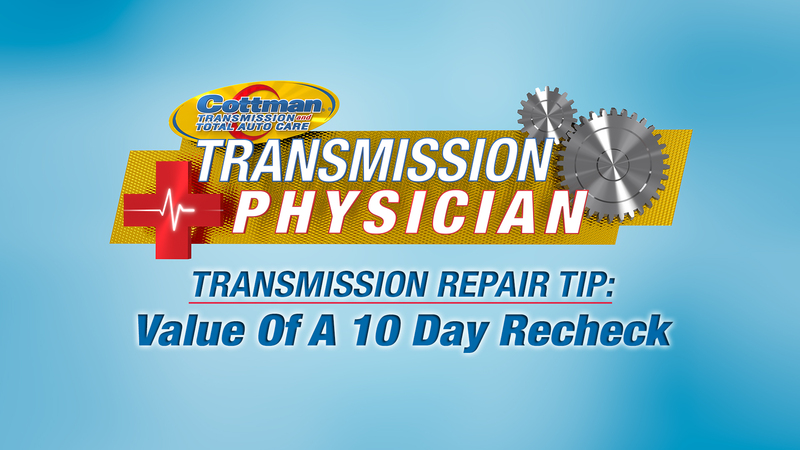 The transmission physicians at your local Cottman Transmission and Total Auto Care center know just what to look for to make sure your rebuilt transmission is working right, and to keep it working for years to come. Because, at Cottman, that’s what we do.